I have two different Edge 2.0's in size 50. The body is about the same, but the sleeve length is quite different between the two. I think different jersey 'templates' sometimes create different fitting jerseys. I have noticed the same thing in Edge 1.0's. Hey all. I have recently been doing a lot of research on authentic jerseys, and I ended up here (seems pretty credible). I have a few questions I hope can get answered. First, I am curious about the proper size for an edge 2.0. I am a short dude (5'7" and 160 lbs.) 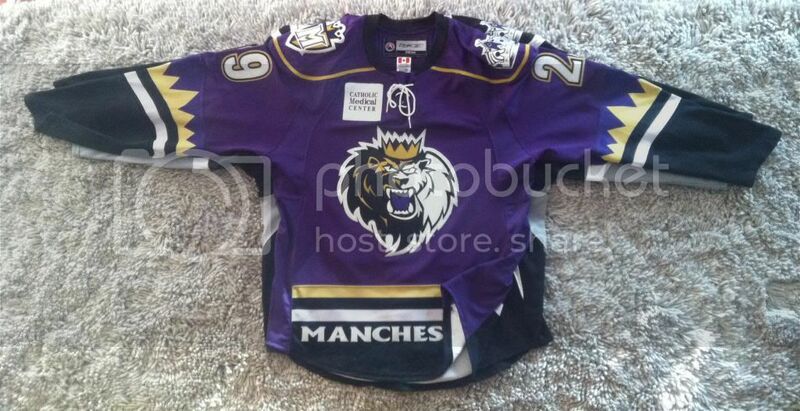 and have always purchased medium premier jerseys. I have found conflicting size charts for the edge 2.0. Ideally, I would buy a size 46 (I think) because I don't want to shell out big bucks for a jersey that is too baggy. The small premier jerseys are the perfect fit for me, but I can still wear the medium just fine. Unfortunately, I've had a lot of trouble finding a 46, and 50 seems to be much more common. What has your experience been with a 50 in comparison to a premier medium? I have always admired the craftsmanship of authentic NHL jerseys, and would like to make the jump for a high quality product. Also, do you have any advice on finding a Flyers edge 2.0 in a 46 or 50? I am staying away from the NHL shop at all costs, and would like a few options that might save me some money. Is IceJerseys the best route? They have both sizes available, but the price is steep. 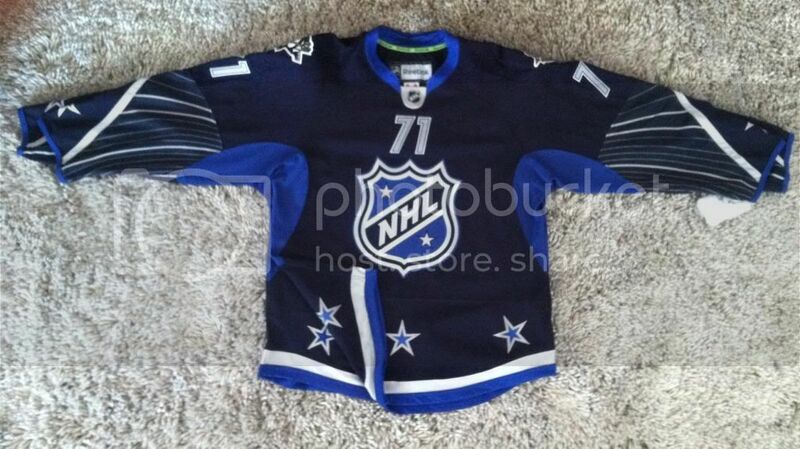 I wouldn't mind buying a blank jersey and having it customized by an NHLPA certified company. Thanks for any feedback. First of all, I'm pretty close to your size (5'9", 150). In my experience a size 50 Edge 2.0 is probably the closest to the medium Premier, but not an exact match. The 2.0 50 will have baggier arms and a slightly larger chest area, so it will feel somewhat larger on top. (If Reebok made a 2.0 in a size 48 I think it would be a really close match to the medium Premier.) Since there are no 48's I prefer to go down to a size 46 in the 2.0. The chest area fits me just fine, not baggy, there's still plenty of room in the sleeves, and best of all the sleeves are just right for me and not too long. The medium Premier and Edge 1.0 size 50 arms are just a bit too long for me. The only thing about the size 46 2.0 is that it's rather narrow (around 22" wide on the sides) so it tends to fit more like a shirt, but I don't really mind that. I feel much better wearing that in public than a 6100 with wizard sleeves. So whether you go with a 46 or 50 depends on whether you mind a slimmer fit around the waist- if you don't, go with the 46. Expect the 50 to fit slightly larger on top than a medium Premier, so if the Premier is slightly big on you, you might think twice about getting a 2.0 size 50. Palmer I'm pretty much the same size as you and prefer a size 50 in Edge. The 46's I have are a tad tight in the chest for me. Agreed, I'm about 5 9, 160lbs and I prefer a 50. Feels more like a jersey. A 46 fits well, and snug, but more like a shirt. Thanks for your help, everybody. I'm still on the fence. I have been talking to the guys from JerseyBaron. Very helpful group of guys. They recommend a 46, and will let me know as soon as one becomes available. Would it be possible for somebody to post a picture of an EDGE 2.0 size 46 on top of a medium premier, and then a 50 on top of a medium premier so I can evaluate the differences? I know that's a lot to ask, but it would be extremely helpful since I am getting mixed recommendations. My main concerns are the sleeve length and body length of the jersey. I know I could always exchange my jersey for a different size if need be, but I would obviously prefer to order the right size from the beginning. Thanks again. I tried to pick jerseys of the same type so you didn't have to worry about different jersey cuts affecting the validity of the comparison. In the first picture you have a size 46 2.0 All-Star jersey over a medium Premier All-Star of the same design. In the second picture, a size 50 2.0 over the same medium Premier. The jerseys unfortunately are the same color, but I think you can still see just how close they are in size, closer than I thought. The width and length are almost identical, but the sleeves of the 2.0 are shorter but wider than those of the Premier. As far as 58, 58+, 60, I've never seen a team use a size 60 edge 2.0 as a gamer. I believe the 60's are a retail only deal as 58+ is not something retail stores sell and are usually only found through private sale from people who bought at an end of season team liquidation or though a "game worn" retailers overstock sell off. The 58+, as you can see in the pics is a bit bigger to accommodate pads for the players that are maxed out at 58. I had a 58+ Anisimov Rangers gamer once and it definitely fit better on me than a 58 which seemed more svelte. Now. If the OP wants long arms...look into Nike Swift jerseys. I have a 62 USA jersey and the arms and body are super long. Anyone happen to have a 54 1.0 vs 56 2.0 OR 50 2.0 vs 56 2.0? Size 50 2.0 on top of a 56 2.0. The 56 is a gamer so I don't know if there may have been a bit of shrinkage. -This jersey size is XL, but these jerseys are said to run big (made by a guy in Thailand who ran the tourney that the above pic was taken at), so is this an XXL in the Reebok Edge Pracice Jersey? I would like to buy a NYR Reebok Edge Practice Jersey. Below is the only place on the planet that seems to have XL and XXL in this jersey. Is this site legitamate? If so, do you advise XL or XXL? Thanks for the warm welcome. Yea, I actually tried to do my homework (in this forum, I admittedly have not looked much beyond it), but I am finding there is Edge 1.0 and 2.0, and I do not know which this is. Also, I noticed that Stepan is a size 56 in what looks like an Edge. He is 2 inches and about 20 lbs smaller than me, so I am thinking I am 58? I do not see the sizes listed as such though, when I look at this, and other pages selling these NYR Practice jerseys. The Liberty practice jersey you are looking to buy is not an Edge jersey. It's a replica of the one the players wore and is very lightweight, and since the logo is heat-pressed, not stitched, it would probably start to come off after repeated washings, unless you stitched it down. It's neither a 1.0 nor a 2.0 because those terms refer only to the pro model (Edge) jerseys, which come in number sizes like 56 and 58. I'm not anywhere near your size but I would guess you could fit well in a 58, although I don't think it would be easy to find one in that size. The Hawks is the same model as the Rangers- I doubt very much that the logo is stitched. Keep in mind that these replicas are designed for casual use by fans. Since you're going to be playing in them, I'm not saying they couldn't be used, but I would have some serious concerns about how well they would hold up. They are not put together anywhere near as well as the pro models. I see. So, which model would you recommend, considering I play in high heat/ high humidity? If my understanding is correct, then the authentics are heavy, correct? I mean, I have been to NHL games, and played in rinks built by smart people (like the LAK training facility- Toyota Center), and in both cases- the rinks are freezing. Even in the nosebleeds section at Staples Center I was wishing I had brought more layers. So, a heavy jersey is not the worst thing in those environments. Where I am playing though (SE Asia), I literally turn into Vapor man, due to the high heat and humidity. Fans walk around in shorts, T shirts, and are BAREFOOT as they stand by the entrances and exits to the ice, so that should tell you something. The ice obviously is garbage, don't even get me started on that.. Anyway, so am I right in thinking pro stock practice jerseys from eBay? (size 58). I actually did a little look, there is one that is dark and will work, bit pricey ($85 or so), for a team I never heard of and do not support, but it could work. PS- Thanks for all the help LAK- I am actually going to LA for summer, but am thinking I may wanna jump on a deal prior, if I can find one. I will be playing at Toyota Center from June 20 or so until Aug 1 if you play too. I played in a Midnight Hockey club game around Dec 28 2013- bunch of people in the film industry that I randomly ran into- no one famous or anything, not trying to sound cool or name drop- all behind the scenes folk, that I got linked up with from a guy on MSH when I was just looking for fun drop-ins. I pulled out a replica Reebok NYR Liberty practice jersey that I had, and you know what? It's not as thin as I thought it was. And now that I know what kind of extreme conditions you're playing in, that may change things. I wear my jerseys mostly to watch games, and you're right, at Staples we freeze our a$$es off, so I wear a sweatshirt under a pro jersey to keep warm. But if you're playing in heat and humidity, a pro-weight jersey may make things unbearable. If you can get a replica cheap, it hopefully won't be a big deal if it doesn't hold up that well. I found mine for $19. With the Rangers practice jersey, I would guess that those spikes on the top of the crest might be more vulnerable to peeling off after repeated washings. You'll just have to see, I guess. I don't play, so I baby my jerseys, and the most stress they undergo is just the occasional wash! Btw that home Rangers replica is about as cheap as you will find for a new one. Cool thanks for the info; I will steer clear of what I found. 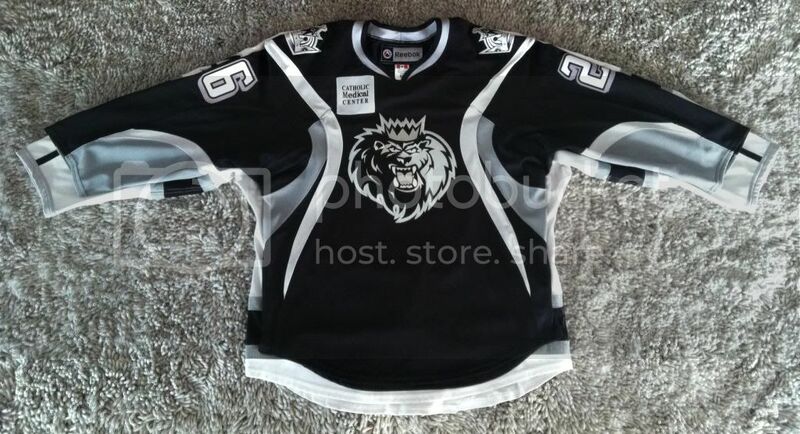 I just learned about this MeiGrey group- looks like they got all the pro stock Reebok Edge practice jerseys. I think I will just try to find one on there, for a team that I do not resent too much. When you say replica, do you mean premier? Or, is there another level down? Replica and premier seem synonomous. 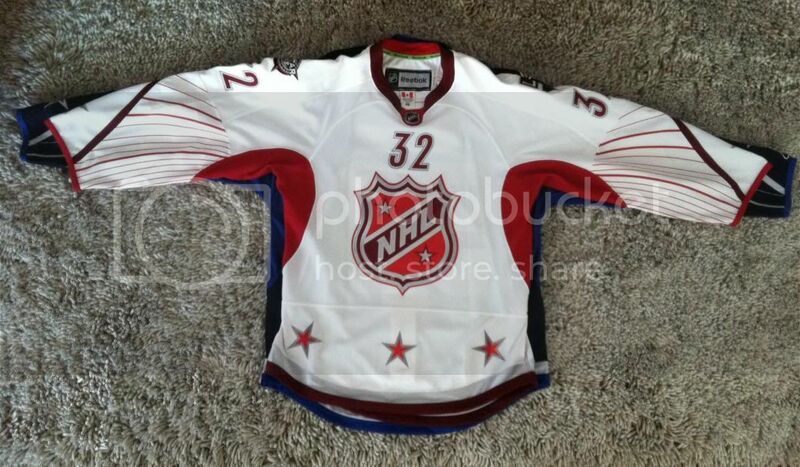 For Reebok jerseys 2007 and later, the replicas are called Premiers and the authentics Edges. You don't generally hear this distinction made between the replica and pro practice jerseys though. The Reebok premier sizing is messed up from what I am seeing on NHL.com, they say I am an Adult Small, but that cannot be right. I know I am XL or XXL. Just trying to figure out which. The more I ponder it, the more I figure I am XL if I am wearing the jersey to the game (without pads). I am XL in all T shirts and regular shirts. And then, I am guessing XXL if I am wearing the jersey with my shoulder pads. I think that my "gamers" are actually XXL, but the rubric that the guys who makes them is using, has them coming our to XL. I wear (XL) CCM Crazy Light shoulder pads, which have neither huge nor tiny shoulder caps, they are sort of right in the middle. When did the Reebok Edge Practice jerseys move from 1.0 to 2.0? I am looking at some of these on MeiGray, and want to make sure that I get into the 2.0s. I am specifically looking at a 2011-2012 Oilers practice jersey. Is this 1.0 or 2.0? I'm about your height but a little heavier, and the 58+ fits me fine, a little on the baggy side which I like. Might be too big for you depending how you like them. I'm not near my jerseys or I'd measure for you.